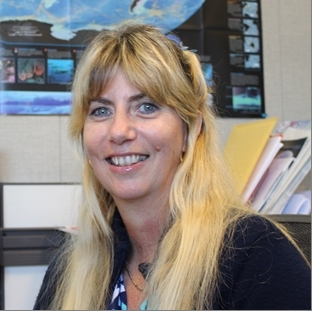 Q & A with NHC - Cristina Forbes, Ph.D.
How did you catch the weather bug? When I was a child, my parents would take me sailing all the time along the coastlines of Argentina and Uruguay. They taught me how to sail, and I started sailing myself in small boats. Then I raced in regattas, won some races and received trophies. I had to learn to read the ocean surface, to know where the best winds and wind speeds were. So, it's more of an ocean bug. I decided to study oceanography. I went into a program at a university in Buenos Aires. It was the equivalent of a master's program because I had to write a thesis. I started doing numerical ocean modeling for my thesis, in which I studied the Antarctic Circumpolar Current. Later, I received funding from the Argentinian government to do more work in numerical ocean modeling, developing a model of the ocean currents along the Argentinian Continental Shelf and converting a hydrological model into a numerical ocean model. How did you get to the U.S.? A professor from the U.S. Geophysical Fluid Dynamics Laboratory (GFDL) was in Argentina and I showed him my work. He suggested I come to the U.S. and obtain a Ph.D. I applied to the University of Miami and received a fellowship to work on a Ph.D. I was also able to obtain a NASA Global Change Fellowship, which paid for the last three years of my Ph.D.
And you continued with ocean modeling? Yes, I was working in numerical ocean modeling. But my advisor said I should do more data analysis, specifically statistical analysis of GEOSAT altimeter data. I did that first, and then I went on to the ocean modeling part of my dissertation, assimilating the altimeter data into an isopycnic ocean model. What brought you to NHC? I was working in storm surge at the University of North Carolina. I had developed a real-time storm surge prediction system for the state of North Carolina. I met (NHC storm surge team leader) Jamie Rhome at a scientific conference. He got me excited about the storm surge program he was creating at NHC and all of its innovations. You have the opportunity then to be creative? Oh yes. In the Storm Surge Unit, we are encouraged to be innovative. We have all of these talented people here with different skills. We complement each other, which is very nice. It's a very cohesive unit. Any special projects of yours? I've been working on an automated prediction system that drives the SLOSH model and creates ensembles to help us make better storm surge predictions. What stands out that needs to be done? I think it's reaching out to the public, being able to communicate all that we learn in science in such a way as to save lives. It is complicated to do so. We are working with social scientists to be able to get the message across in a way to better reach the public, analyzing what works and what doesn't work. That's never been done before. Usually, people rely on their experiences. And if they have never experienced something before, it is tough for them to open up and realize this is going to be different and something they had not seen before. And that is a challenge and difficult to communicate to people. What will we see in 2013? We are working on the inundation graphic, which will reach more people and is a more understandable way of portraying storm surge. It's a big step for us. We still have a lot of details to work out before June 1st, but it will be experimental this year and perhaps operational next year. What do you see yourself doing down the road? I love working here, and hope to continue improving storm surge prediction, to keep trying to send a message to people to save their lives and to keep applying the new scientific advances. I have the freedom to put my skills in the Storm Surge Unit to work. What do you do to escape? I like sailing, running along the beach, along with swimming and snorkeling. I also love doing puzzles, especially logic puzzles to stretch my brain. And I don't quit until I finish them!